Bulbophyllum Orchid species include rare orchids such as Bulbophyllum globuliforme or ‘Hoop Pine Orchid’. Bulbophyllum shepherdii with its white flowers and others including B. picturatum (photo right). Most Bulbophyllum orchids are grown as mounted orchids however this is a large and varied genus. 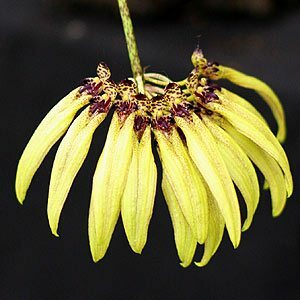 One of the most interesting species is Bulbophyllum medusae (Medusa’s Bulbophyllum) while Bulbophyllum grandiflorum with its large redish brown flowers is also worth looking for. B.globuliforme or Miniature Moss-orchid is a fascinating species that grows only on the bark of Araucaria cunninghamii and is rarely seen in cultivation. B. elisae or Pineapple Orchid is an epiphyte orchid that will form a mat. B. lobbii is more common and is a variable species from Borneo. B. graveolens is perhaps the most widely grown species. One of the best cultivars is Bulbophyllum ‘Elizabeth Anne Buckleberry’. Australian species include B. bracteatum which is found in areas including the Lamington National Park and nearby Border Ranges National Park. B. baileyi is found in the tropical areas of Northern Queensland and also in New Guinea. B. weinthalii is a large flowering species that in nature grows as a epiphytic orchid in Hoop Pines. What was B. gracillimum but is now named Cirrbopetalum gracillimum in another from far North Queensland also known as the Wispy Umbrella Orchid. The list is longer with around 40 species being found in Australia.